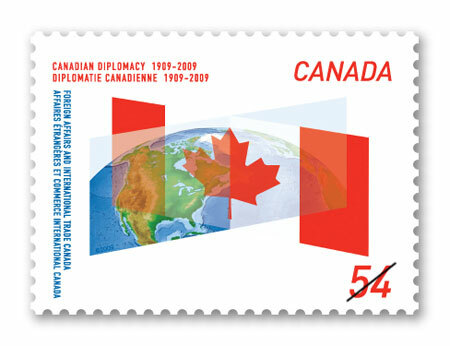 On June 1st, 2009, Canada Post began issuing a stamp highlighting the role of Canadian diplomacy over the past 100 years. This domestic-rate stamp commemorates the Centennial of the Department of Foreign Affairs and Internation Trade. Diplomacy is employed to find solutions to challenges or problems faced by nations of the world. Negotiations may be initiated to improve relations between countries, or foreign policies may be introduced to deal with current issues. Sharing a border with the United States has allowed Canada to hone its skills in this regard; however, Canada’s role is ever-evolving and appropriately celebrated with this postal issue.